music playback isn’t very smooth, or music starts and them immediately freezes. you can’t broadcast messages to other Home devices. Netflix or YouTube doesn’t open when you tell it to. online lookups are spotty and work only half the time. Google Home says “something went wrong, try again” way too often. the device creates static even when nothing is playing. Fortunately, because Google Home is a wireless device, there are a number of places we can look for a possible solution to why it isn’t connecting to Wi-Fi, from not only the device itself but also nearby devices that are on the same network. This one should be obvious, but Google Home doesn’t know how to reach the internet until you explain to it how to connect to your Wi-Fi. In other words, nothing will work on your Google Home until you set it up using the Google Home app. Download Google Home for Android or get it for iOS. The specific steps you need to take within the app to connect Google Home to Wi-Fi are explained in our How to Set Up Google Home guide. If Google Home used to connect to Wi-Fi just fine but you recently changed the Wi-Fi password, you’ll need to reconfigure Google Home so you can update the password. To do that, you first need to disconnect its current settings and start fresh. From the Google Home app, tap the device you want to reconfigure. Tap Settings (the gear button) on the Google Home device that needs its Wi-Fi password updated. Choose Wi-Fi and then select Forget network. Tap Add on the main screen of the app. Choose Set up device and then New devices. Pick the home to add Google Home to, followed by Next. Continue with the onscreen instructions or follow the setup directions linked above for help. Your router is the only way Google Home can connect to the internet, so it’s that connection point that you should look at first. This is easy: just move the Google Home closer to your router and see if the symptoms improve. If Google Home works better when it’s closer to the router, then there’s a problem with either the router or interference between the router and where your Google Home normally sits. A permanent solution is to either move the Google Home closer to the router or move the router somewhere more central where it can reach a broader area, preferably away from walls and other electronics. If you can’t move the router or moving does no good, and restarting doesn’t help, but you’re sure that the router is to blame for the Google Home Wi-Fi problem, you might consider replacing your router with a better one, installing a better router antenna, or purchasing a mesh network instead, any of which should improve coverage. When it comes to Bluetooth connections, the same idea applies: move the Bluetooth device closer to the Google Home, or vice versa, to confirm that they’re paired correctly and can communicate properly. If static goes away or they generally work better when closer together, then it’s more of a distance or interference issue, in which case you’d need to adjust where things are positioned in the room to ensure that other devices aren’t affecting Google Home. This might seem like a drastic, or even unrealistic solution just to get your Google Home working again, but bandwidth could be a real issue if you have lots of devices accessing the internet via the same network. If you have too many things actively using the network at once, you’ll definitely notice problems like buffering, songs stopping randomly or even not starting at all, and general delays and missing responses from Google Home. If you notice Google Home connection problems while you’re doing other network related tasks like downloading movies to your computer, streaming music to your Chromecast, playing video games, etc., pause those activities or consider only doing them when you won’t be using your Google Home. Technically, this isn’t an issue with Google Home, Netflix, your HDTV, your computer, a music streaming service, or any other device. Instead, it's simply the result of maxing out your available bandwidth. The only way around limited bandwidth connections is to upgrade your internet to a plan that provides more bandwidth or, like we mentioned above, start limiting which devices are using the network simultaneously. If shutting down problematic network devices doesn’t let Google Home connect to Wi-Fi, then there’s a good chance that Google Home should be restarted, and while you’re at it, you may as well restart your router just to be sure. Restarting both devices should clear out whatever temporary issue is causing the intermittent problems you're seeing. Tap the device you want to reboot. Select the settings icon at the top, followed by the three horizontal dot menu. See our guide on restarting a router if you need help doing that. The section above for restarting these devices will, as you probably noticed, simply shut them down and then start them back up. Resetting is different since it will permanently erase the software and restore it to how it was when you first purchased the device. Resetting should be your last attempt to get the Google Home to work with Wi-Fi because it erases every customization you made to it. 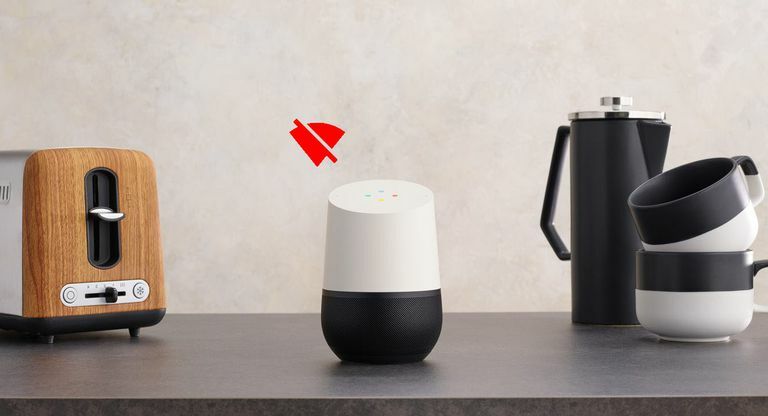 Resetting Google Home unlinks all the devices and music services you attached to it, and resetting a router erases things like your Wi-Fi network name and password. So, obviously, you want to only complete this step if all the others above didn't work to get Google Home on Wi-Fi. However, because of how destructive this is, it’s a likely solution to most Google Home Wi-Fi issue since it resets everything that can be reset. If you'd rather, you can reset one but not the other, to see if the problem goes away without having to restore the software on both devices. For example, follow these steps to reset your router and then see if Google Home connects to Wi-Fi. Reset Google Home: Press and hold the microphone mute on the back for around 15 seconds or until you hear it say that it’s resetting. Google Home Mini: Turn the device over and look for a circle at the bottom. Press and hold that FDR button for 15 seconds. You should hear Google Assistant tell you that it’s resetting. Reset Google Home Max: Locate the FDR button by the power cord on the back of the device, and press-and-hold it down for about 15 seconds or until you hear it tell you it's resetting. Reset Google Home Hub: Press and hold both volume buttons on the back of the device for 10 seconds. Google Assistant will tell you when it's resetting. At this point, you should have configured Google Home to use your internet, positioned it close enough to the router to establish a strong connection, eliminated interference from other devices, and both restarted and reset not only the Google Home but also your router. There isn’t much more you can do now except contact Google Home support. There might be a bug in the software that they need to update, but more than likely, there’s an issue with your specific Google Home. If not that, then your router might be to blame, but if it’s working fine for everything else on your network (i.e., your computer and phone can connect to Wi-Fi but Google Home doesn’t), then chances are good that there’s a problem with Google Home. You might be able to get a replacement from Google, but the first step is to contact them about the problem and explain everything you’ve done to remedy the problem. See How to Talk to Tech Support before you get started, and then you can request a phone call from the Google Home support team or chat/email with them.